Credit: Wikimedia Commons. Click to enlarge. You gotta love these people: no one really knows where they came from, no one really knows what happened to them (even though they built what was the largest city in the Americas at the time), their primary deity was a woman, and they built the coolest pyramids around. 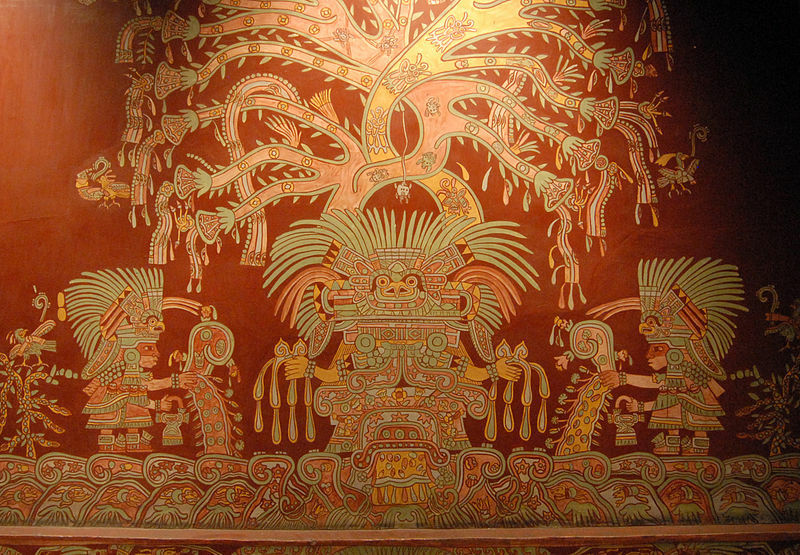 The Great Goddess of Teotihuacan. Credit Wikimedia Commons. Louise wears her exceptionally cool Expat Almanac hat as the Pyramid of the Sun looms behind. Okay. Heart won. I didn’t go. (I came home and downloaded a panorama taken from the top instead. It appears at the top of this post. Be sure to click it to enlarge.) 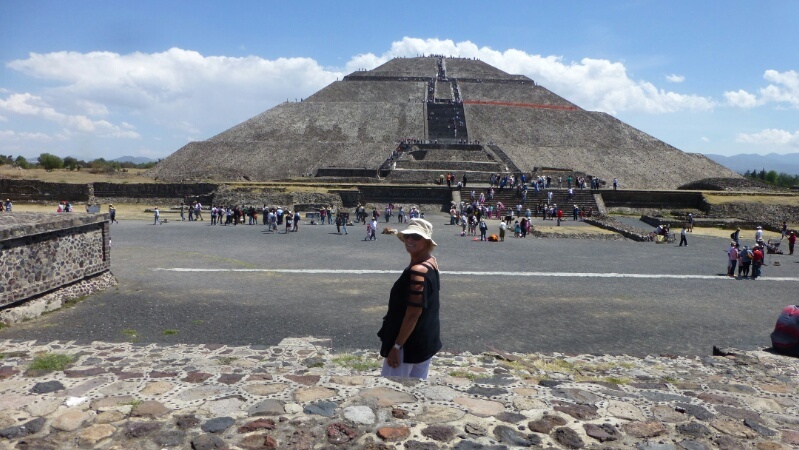 I did go to the top of the smaller Pyramid of the Moon. Heart kept his opinion about that endeavor to himself. Looking down the stairs from the Pyramid of the Moon. The long, straight street is the Avenue of the Dead. 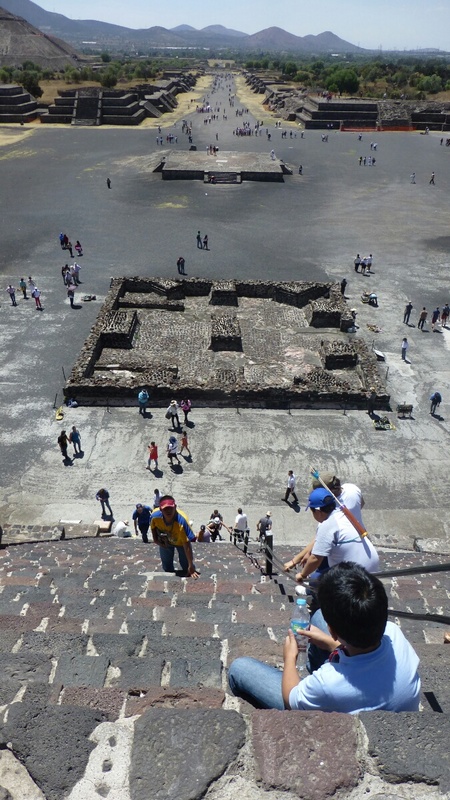 As our guide Vicky explained it, Teotihuacan was founded some 100 years before Christ by the Toltec, or the Maya, or the Zapotec, or the Mixtec. I think it was aliens. She said nothing about aliens but really, antigravity had to be a factor back in the days of monster pyramids. There were no Caterpillars or John Deeres, after all. None of those Mesoamerican guys had antigravity. Cudda been Martians. Whomever they were, there were a lot of them (estimates range from 125,000 to 250,000), and to house that many people they built multi-story apartment houses, wide, straight streets (compare with the labyrinthine streets of Rome or Istanbul), and even roundabouts. Twentieth-Century stuff. Coolest of all: nothing military. No guns. No fortifications. Not even a little death ray. Then, one not-so-fine day circa 536 A.D., the largest city in the New World collapsed. There is evidence that things were burned, which points to either an invading force or some kind of struggle between the rich and the poor, since it appears to have been the spoils of the rich that were destroyed. Vicky thinks water became too scarce for survival, sort of a pre-Columbian global warming. But where did they go? 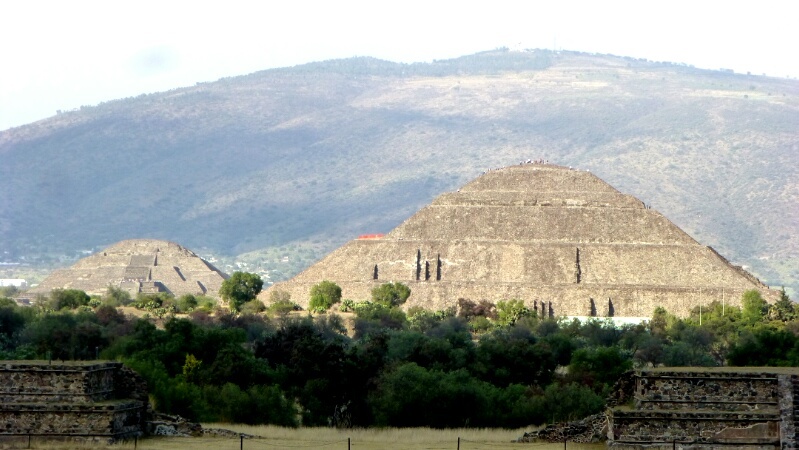 The Pyramid of the Moon (left) and the pyramid of the Sun photographed from the Temple at Quetcalcóatl, about two miles distant. And that, for a dreamer like me, is Teotihuacan’s appeal. Nobody really knows. Nobody knows where they came from, how they lived, or what took them away. What we do know is that they left a wondrous pile of rocks and a conundrum of mystery that even the best archaeological minds of the day can’t explain. Where is Dan Brown when we need him? Aw shucks, Terri. ::: shyly shuffling feet in sand ::: You know that everything I learned about telling stories I learned by reading Gallivance.net.